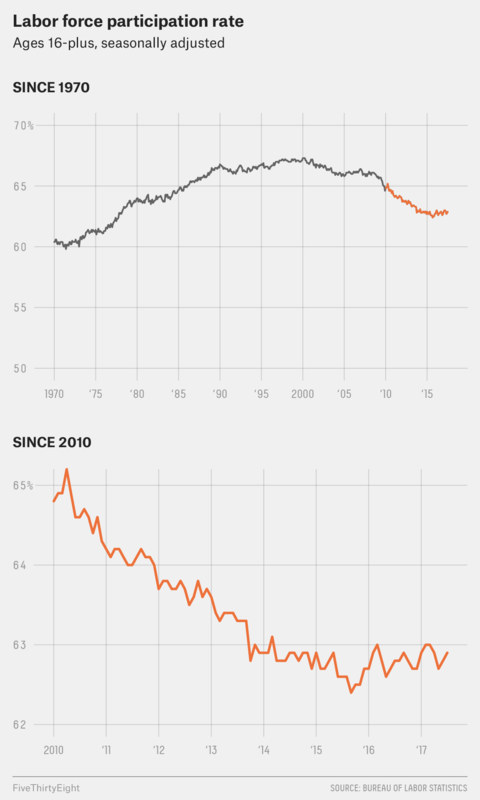 The U.S. job market’s long recovery is going strong — and there are signs it still has room to run. U.S. employers added 209,000 jobs in July, the Bureau of Labor Statistics reported Friday. That was modestly better than economists’ expectations; more significantly, it marked the 82nd straight month of job growth, a record. The unemployment rate, which rose slightly in June, ticked back down in July to 4.3 percent, tied with its lowest mark since 2001. With unemployment so low, economists have been watching for signs that the economy is nearing “full employment,” the point at which essentially everyone who wants a job has one. That mark is significant because standard economic theory suggests that once the economy runs out of spare workers, companies will have to start boosting pay to attract employees. That would be a welcome development for workers but would also likely spur the Federal Reserve to raise interest rates to try to keep the economy from overheating. Friday’s report, however, showed little sign that that was happening. 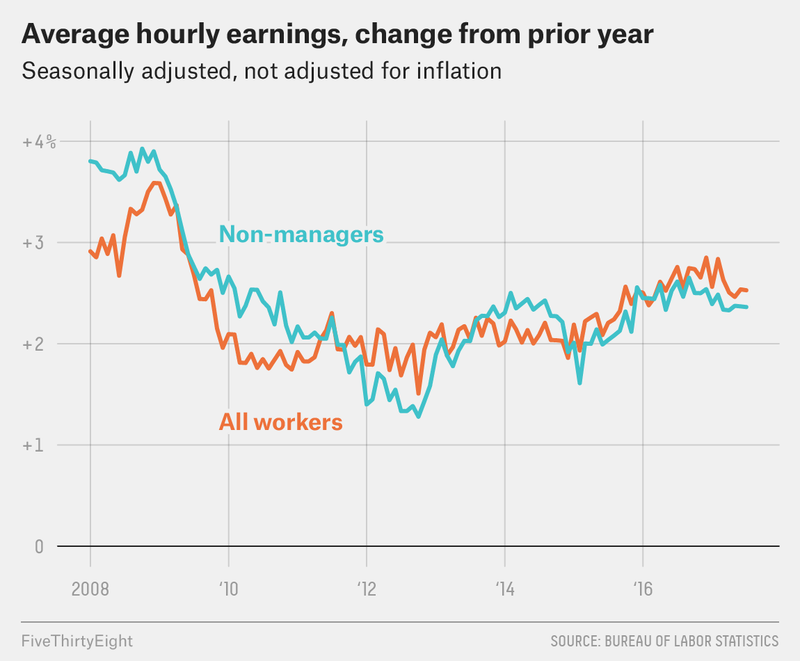 Earnings are rising, but they aren’t accelerating in a way that suggests employers are struggling to find workers. Average earnings rose 9 cents an hour in July and are up 2.5 percent over the past year; the rate of growth has held more or less steady for more than a year. Other, more sophisticated measures of wage growth likewise don’t show growth picking up. Meanwhile, the U.S. doesn’t seem to be running out of available workers, at least not yet. Rather, the improving job market seems to be drawing people off the economy’s sidelines. The labor force grew by 349,000 people in July; the so-called participation rate — the share of adults who are either working or actively looking for work — has been essentially flat for the past year and a half. That’s an impressive trend given the ongoing retirement of the baby boom generation, which puts downward pressure on the participation rate. It’s unclear how long the current growth can continue. The monthly jobs figures are volatile; only two months ago, a weaker set of data suggested full employment might be just around the corner. But beyond the month-to-month data, there is reason to think the recovery can keep going. 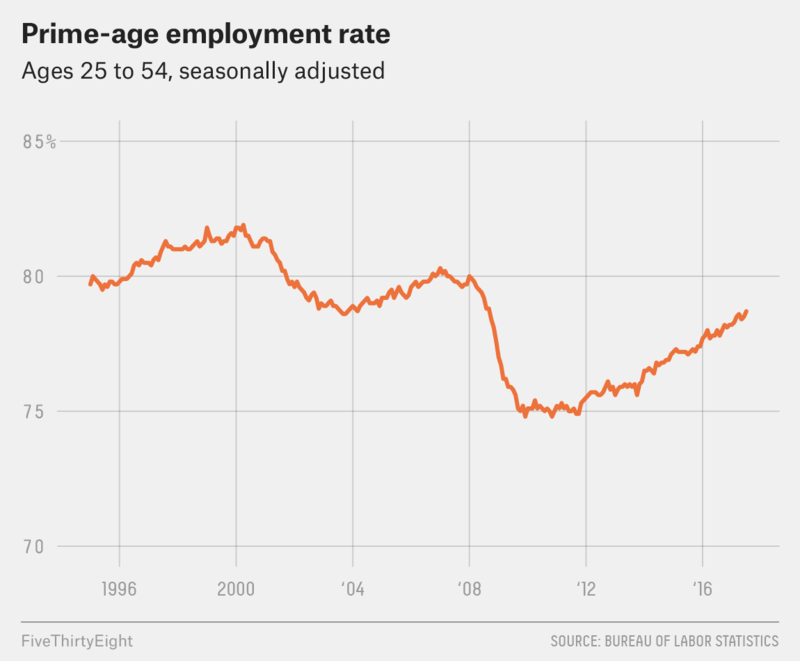 Take one statistic, the prime-age employment rate, which looks at the share of 25-to-54-year-olds who have jobs. The figure rose in July to 78.7 percent, its highest mark since 2008, but still remains below the level of the late 1990s and early 2000s. That suggests that even more people will get jobs if the economy gets good enough. The recovery finally seems to be spreading to hard-to-reach corners of the economy. For much of the recovery, strong job growth hasn’t translated into wage gains for many Americans. Now, there are finally signs that’s changing; in the first half of the year, according to a recent analysis by the left-leaning Economic Policy Institute, wage growth was strongest among the lowest-earning workers. A related report showed wage gains have been strongest for less-educated workers. Those numbers, combined with Friday’s report, hint at what Barclays economist Michael Gapen dubbed a “Goldilocks” moment for the economy: Wages are rising, but not so quickly that the Fed needs to intervene aggressively to head off inflation. Workers, many of whom are still waiting to see the benefits of the eight-year-long recovery, will enjoy that moment for as long as it lasts.